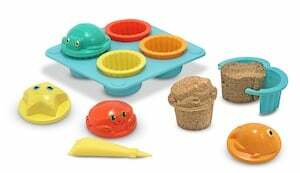 The Melissa & Doug - Cupcake Sand Mold Toys is a 12-piece sand molding set that turns the beach or the sandbox into an outdoor bake shop. These Melissa & Doug toys are easy to use: just fill the cupcake mold with sand, add a cupcake topper and then let them "bake" in the sun. You can even add decorations with an icing tool or dump it all out and start again. This sandbox toy includes four cupcake cups and toppers and a four-cup baking try.